Why Was Jesus Born In Bethlehem? Why Does St. Barbara Hold a Cup in Her Icons? The holy and respected Lavra of our Holy Father Savvas the Sanctified in the Judean desert is a uni­que phenomenon in ecclesiastic history because of its contribution in forming worship and the monastic order and hymnography as well as its multitude of Saints, austere anchorites, and divinely inspired theologians and martyrs. Even more significant was the decisive role of the Lavra in fighting the heresies which appeared in the Holy Land after its foundation, the defense of Orthodoxy and the rights of the only legitimate Patriarchate of Jerusalem, namely the Greek Orthodox. The Great Lavra of St. Savvas, now celebrating more than 1500 years (483 A.D.-present) of unceasing monasticism, owes its foundation and development to the God-endowed and Spirit-bearing monk Saint Savvas (439-532 A.D), who was the lamp shining from on high for those wishing to live the life of an anchorite and fervent intercessor before the Lord for all future "Sabbaite" monks. The first nucleus of the Lavra was created by seventy hermits who had gathered around St. Savvas in 483 A.D. Subsequently, the Lavra was relocated from the eastern side of the Kidron Valley, where the hermitage of St. Savvas was located, to the western side, where the Theoktistos Church was built (486, consecration 491 A.D). The increased number of the brotherhood members made it necessary to build the main church of the Theotokos (502 A.D) and to organize the Lavra buildings and facilities so as to serve the ever increasing needs. St. Savvas' reputation and holiness, which resulted in his elevation to head and instructor of all the anchorites of the Jerusalem area (493 A.D), influenced even the Great Lavra which became the model of monastic life and liturgical order -the Typikon- not only for the other three lavras and six coenobiums which St. Savvas founded before his death (532 A.D), but also for the other monasteries in Palestine and, during the Middle Ages, the worldwide Church. Under the leadership of Saint Savvas, the Great Lavra initially undertook the fight against the heresy of Monophysitism from 512 to 516 A.D, confronting Emperor Anastasios and the other three Patriarchates of the East, which were in the hands of the Monophysites. The courageous stand and confession of the anchorites saved the Patriarchate of Jerusalem from heresy. St. Savvas' successors in the abbacy made the Lavra a stronghold against the heresy of Origenism. Under the guidance of the Sabbaite St. John the Hesychast, former bishop of Colonia (454-558), the Lavra abbots Gelasios (537-546), Kassianos (547-548) and Κοnοn (548-568) overwhelmed the wiles of Origenists and their intrigues before the emperor Justinian, yet not without cost. The monks of the Lavra, which was the only monastery supporting Orthodoxy, suffered persecution and acts of violence and eνen the enforced enthronement of the Origenist Abbot Georgios (547 A,D). Neνertheless, God saνed the Lavra, and Konon's actions contributed greatly to the summoning of the Fifth Ecumenical Synod (553 Α.D), which condemned the errors of Origen once and for all and favored the entire Church foreνer. The appearance of the Persians in the Holy Land (614 Α.D) was the prelude of the inνasion of the Arabs and of Islam (638 Α.D). The first holy martyrs of the Lavra were the forty-four Sabbaite fathers slain by the Persians on the 16th of May in 614 Α.D. The reorganization of the Great Lavra under Patriarch Modestos after the Arabian conquest was followed by the glorious period, the "golden age of the Lavra, namely the eighth and part of the ninth century A.D. The greatest theologian of the eighth century, Saint John of Damascus, the hymnographer Kosmas the Hagiopolite, Stephanos the Melodist, Michael the Synkellos, Theodore and Theophanes the Graptoi (Branded), Theodore bishop of Karron (Abu Qurrah), - distinguished for their holiness and theology, and the Saints Stephanos the Wonderworker, Theodore bishop of Edessa and Michael the holy martyr enriched both the Church of Jerusalem and the Universal Church. Despite the violent and murderous invasions of various barbarians (796, 809, 813 Α.D) and general disorder, the contribution of the Lavra to the Church reaches its peak with the stand in favor of the holy icons of Saint John of Damascus during the first period of Iconoclasm (726-787) and that of Saints Michael Syncellos, Theophanes and Theodore the Graptoi (Branded) during the second period of Iconoclasm (814-843 Α.D.). The significant role of the Lavra for theology is evidenced by the fact that the last three above mentioned confessors were summoned to Constantinople by St. Theodore the Studite in relation to this subject. Apart from its theological literary production during this period, the Lavra increased its copying and translating activities, becoming the center of Georgian literature from the seventh to the tenth century, as well as the center for translation of ecclesiastical writings from Greek into Arabic. Α characteristic example of this is the widely known Ascetic Homilies by St. Isaac the Syrian which were first translated from Syrian into Greek by the monks Αvramios and Patrikios at the end of the 8th century. The liturgical Typikon of the Lavra, along with the hymns of the Sabbaite hymnographers and probably certain monastic practices of the Lavra, were widely disseminated by distinguished monastery founders from the 9th till the 13th century. The Lavra Typikon influenced, to a greater of lesser degree, the monastic Typika written by St. Theodore the Studite (9th cent. ), St. Paul the Younger of Mount Latros (11th cent. ), St. Lazaros of Mount Galesion (10th-11th cent. ), St. Luke of Messina (Sicily 12th cent. ), St. Neophytos the Recluse (Cyprus, 12th-13th cent.) and St. Nilos of Tamasia (monastery of Maheras, beginning of 13th cent.). Already in the 9th century the Typikon of the Lavra had found its way to far-away Georgia (by Gregory Khandzta in 826 A.D.). Parallel there was also a spreading of the new hymnographic poetic form, the canon, developed mainly by St. John of Damascus and his subsequent "Sabbaite poetic school". The hymnographic production of the Lavra was the foundation upon which ecclesiastical worship was shaped in the period after Iconoclasm. The eight tones in the melody, ascribed to St. John of Damascus, prevailed in worship, while his Octoechos constituted the core of the Paraklitiki, the main liturgical book of the Church. During the occupation of the Crusaders, the position of the Lavra abbot appears to have been exceptionally high with the Latins, on account of the absence of an Orthodox patriarch in Jerusalem. The Lavra was endowed with assets by Queen Melissenda (1131-1162) while the church of the Theotokos and its frescoes were renovated by the emperor Manuel Komnenos (1143-1186) circa 1169. The victory of Saladin's Mamluks against the Crusaders in 1187 Α.D was the beginning of still further hardships for Palestinian Monasticism. 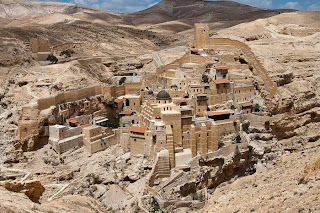 Despite the renewed slaughter of Sabbaite monks, the Lavra continued to function when all others in the desert were destroyed. During this period the Lavra shrank to its core, the surrounding walls were erected and the monks adopted the coenobitic way of life abandoning the lavreotic. The Lavra then went through the most difficult phase of struggle for survival within a hostile environment. Nevertheless, it became a significant school for the Brotherhood of the Holy Sepulchre which taught the monastic way of life and matters concerning ecclesiastical subjects. Α new renovation of the Lavra Katholikon and St. Savvas' Tomb by the emperor John Kantakouzinos was carried out in the middle of the 14th century. Even more decisive for this period and for the future of Orthodox worship was the spread of the so-called "neo-Sabbaitic liturgical Typikon" (i.e the synthesis of the old Sabbaitic Typikon with elements of the Studite Typikon). Having replaced the Typika of the Studite and the Mother of God Evergetis monasteries this Typikon was established in Constantinople in the 13th and 14th century (Convents of Lips, St. Demetrios Kellibara and Mother of God Vevaia Elpis). During this period, the Typikon was established as far away as Serbia by St. Sava the Serbian (1175-1236) and the archbishop of Serbia Nikodemos (1317-1324). The new Sabbaite Typikon, on account of the radiant theology of Hesychasm, spread throughout the Balkans, Bulgaria and Russia. From its definitive prevalence everywhere in the 16th century υntil today, the sabbaite-athonite liturgical Typikon has been established as the Typikon of universal Orthodoxy. The Turkish invasion of Palestine under Sultan Selim, accompanied by a new slaughtering of the Sabbaite fathers, did not affect the life of the Lavra favorably. Although the sultans had issued more than thirty firmans (between 1533 and 1735) concerning reconstruction of the Lavra buildings, tax exemptions and the protection and rights of the Sabbaite Brotherhood, the Sabbaite fathers suffered greatly for many years and whole Arabic villages moved into the Lavra. The significant presence of Serbian monks in the Lavra, which had initially been a positive bolstering of the small number of Greek monks, ended at the beginning of the 17th cent. when the Serbians were unable to pay off the debts accrued by their construction activities. The intervention of Patriarch Theophanes IIΙ (1608-1644) barely saved the Lavra from the hands of the Armenian and Latin creditors. Among all the benefactors and donors of the Laura were the patriarchs of Jerusalem Nektarios (1660-1669) and Dositheos II (1669-1707), the so-called "great benefactor", since they succeeded in restoring the Lavra to the exclusive use and habitation of the Sabbaite fathers. Furthermore, they undertook (chiefly Dositheos) numerous and expensive renovations and expansions of the churches, buildings, reservoirs and the wall of the Lavra during the years 1667 and 1686. Our Lavra owes the present condition of its buildings to constructive activity carried out after the catastrophic earthquake on 13th May 1834 and the subsequent abbacy of Ioasaf the Cretan (1843-1874), a saintly figure of Palestinian monasticism of recent times. Proof of the spiritual depth of this holy, simple, humble and discerning monk is the fact that, for the first time after many centuries, the number of the Sabbaite fathers rose to around eighty. The continual political changes in the Near East during the 20th century have, by the Grace of God and the intercessions of Theotokos and our Father St. Savvas, created fewer problems for the Lavra than for other monasteries and shrines of the Orthodox Patriarchate. On the contrary, the return of the incorruptible Holy Relics of St. Savvas in 1965, after their long absence (possibly since the 13th century) has proved to be a great blessing for the Brotherhood of the Holy Sepulchre, the Lavra monks and all the Orthodox Christians of the Holy Land, but also undoubtedly the cause of sure hope in God and evidence of the unceasing fatherly care of St. Savvas for his Lavra. 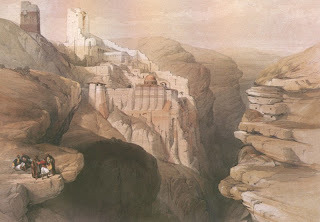 The spiritual life of the Lavra and the diversity of its contributions to the confrontation of the problems faced by the fathers of the Holy Sepulchre, the Orthodox flock and the pious pilgrims of the Holy Places, makes it possible even today to confirm the truth of the age-old assertion: "Just as Jerusalem is the queen οf all cities, so too the Lavra of St. Savvas is the prince of all deserts, and so far as Jerusalem is the norm of other cities, so too is St. Savvas the exemplar for other monasteries".